The beauty of Islam is that it’s never too late to ask ALLAH for forgiveness but we also have to remember you never know when you’ll die. Here in the following you'll get Public Health Engineering Department DG Khan Jobs 2019 Advertisement Latest Vacancies announced on disabled person holding valid Punjab Domicile. 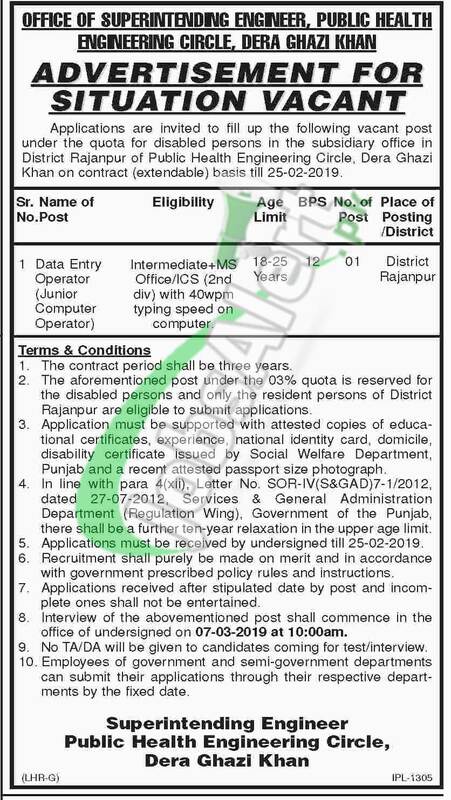 Punjab Health Engineering Circle DG Khan invites applications for the vacant post of (Data Entry Operator (Junior Computer Operator)) on three years contract basis which is further extendable. Candidates willing to apply should possess qualification from Intermediate with Computer Diploma and relevant experience and only suitable candidates should apply on or before the last date 07th March 2019.